On TLV1. Second link, if problems. New York-born Yisrael Medad is a high-profile right-wing journalist and blogger. Medad, the director of educational programming and information resources at the Menachem Begin Heritage Center in Jerusalem, grew up in the midst of New York’s Jewish community, and became politically involved at an early age. In his teens, he joined the revisionist-Zionist youth movement Betar, and took part in its “unofficial” activity – which included, among other things, street fights with German-American neo-Nazis. Medad made aliyah in 1970, and has since been an active member of the settlement movement, in which capacity he was involved in the attempt to establish a Jewish settlement in the Palestinian village of Sebastia, in the 1970s. 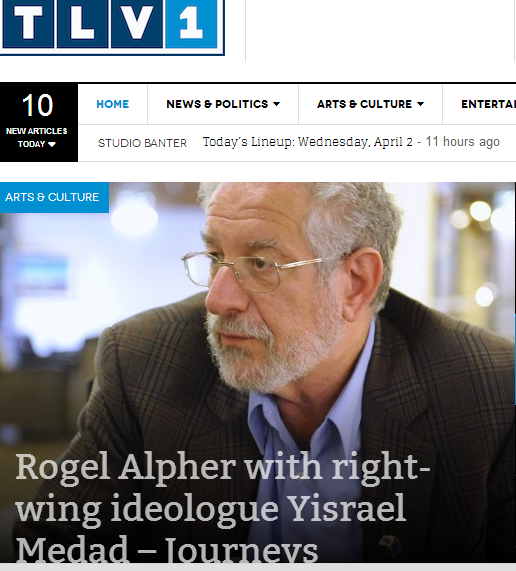 Join Rogel Alpher for a journey into the mind of a strong-minded right-wing ideologue, who refuses to recognize the Palestinians as a national collective — but that, he says, doesn’t exclude the prospect of dialogue. Not "in" but opposite, at the old Turkish railway station.